The museum’s Hunt Blacksmith Shop will be open with the forge fired up and a smithy at work. 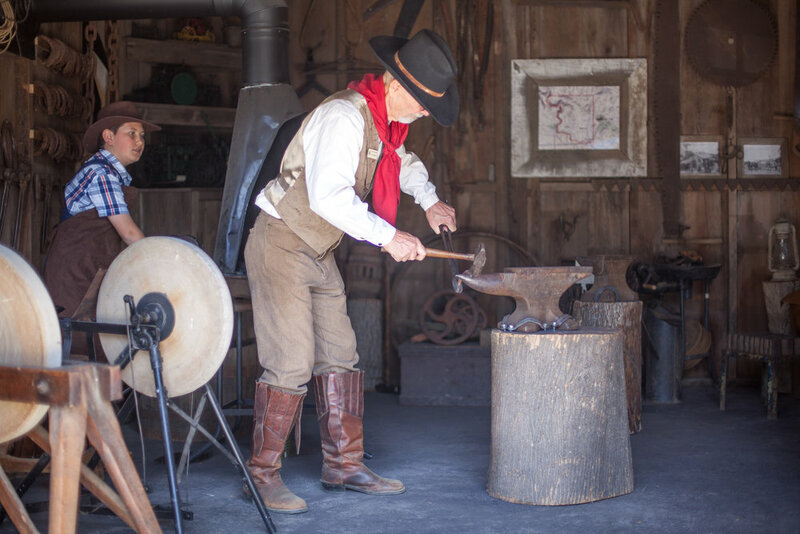 Come and experience a bit of Conejo Valley history: blacksmiths were a vital part of our farming and ranching industry. Most ranches would have had their own blacksmith workshop and the ranch blacksmith fashioned or fixed just about anything made out of metal, including horseshoes, farm equipment, and wagon parts. Blacksmith shops could also be found in most settlements. 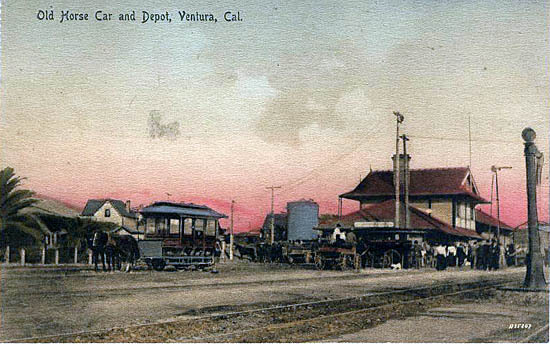 In Ida Addis Storke’s 1891 history of Ventura County, she mentions a blacksmith shop in Timberville, the hamlet which grew up around the Conejo Hotel in the late 1800s. Dr. Greg Erickson is our April speaker with a presentation on “Dstretch” Technology Leads to the Discovery of New Rock Art in Poway and Rancho Bernardo. Native people who lived along Green Valley Creek in Rancho Bernardo and Poway produced extraordinary rock art. Named the Rancho Bernardo Style (RBS) by Ken Hedges, this type of rock art is not found anywhere else in North America. Since its discovery almost a century ago, this rock is now highly weathered and almost impossible to visualize with the naked eye. Because of this, much of the rock art has remained either unrecognized or poorly defined. Recently, a new state-of-the-art technology, termed DStretch, has enabled visualization of previously invisible images. Using DStretch, Dr. Erickson has discovered and will present a stunning array of fascinating new RBS motifs. Dr. Erickson received a Ph.D. in Biology at the University of California, San Diego, and after completing postdoctoral training at Harvard Medical School, he joined the faculty in the Department of Reproductive Medicine at UCSD. Now retired after 30 years at UCSD, he is currently Professor Emeritus. He is a member of the American Rock Art Research Association, a docent at the Kumeyaay-Ipai Interpretive Center in Poway, and President of the San Diego Rock Art Association. 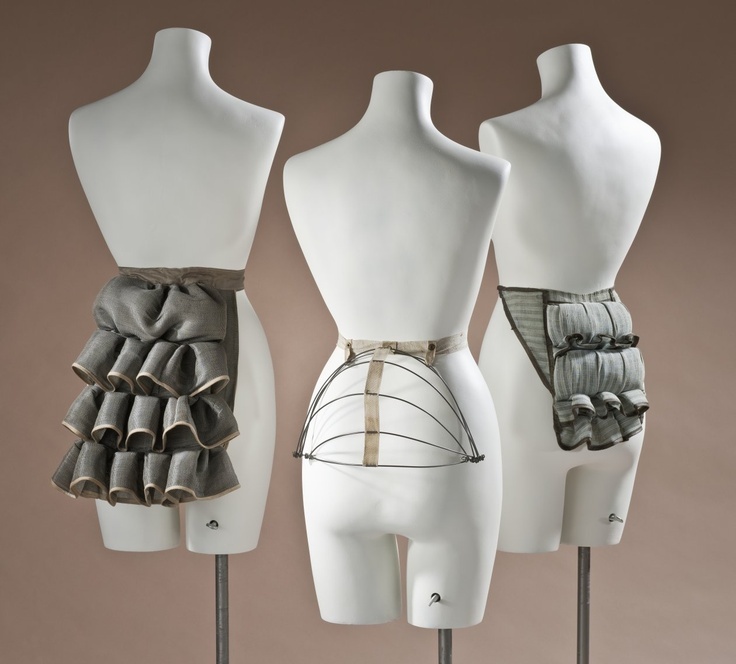 Our guest speaker, historian Glenda Jackson, present Corsets, Bustles, and Hoops - Oh My! Glenda will show off her extensive collection of lingerie from centuries past. Please feel free to bring your - or your mother’s or grandmother’s - special lingerie items for show and tell after the refreshment break. RSVP to Penny, pen1@verizon.net or home 805-495-3297, cell 805-444-3160. Roz, rozgold@yahoo.com or home 818-889-6904, cell: 818-667-3899. Lindalisa, lindalisasemail@yahoo.com or 818-414-8046. 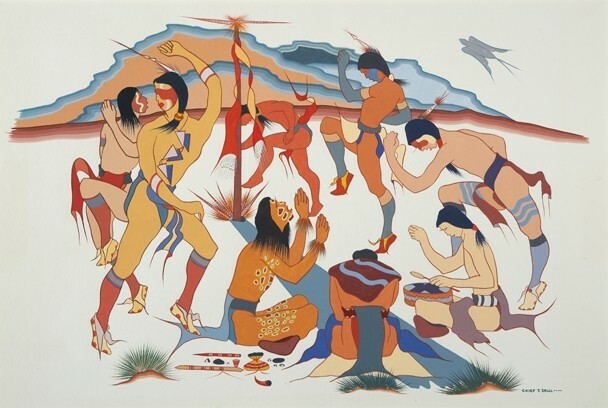 Terry Saul’s paintings center around old Choctaw customs, often based on surviving fragments of information. This fieldtrip to the Cal State Channel Islands campus includes a tour of the Broome Library and the traveling exhibit Native Voices: Native Peoples’ Concept of Health and Wellness. We’ll have lunch in the campus cafeteria afterwards. Meet at the museum at 9:15 in the Susan Drive parking lot. $5 donation to CSUCI. R.S.V.P. to Cynthia Bengtson at (805) 499-1507 or to Debra Payne at (805) 501-2417. We’ll try one more time to fit a rose pruning demonstration in-between rainstorms! Call the museum to make sure we’re able to meet on March 2nd. Rose lovers (you know you’re crazy about roses!!) are invited to join us in the Museum’s Heritage Rose Garden for a demonstration and workshop on how to prune Old Garden Roses and shrub roses. Jeri and Clay Jennings, Camarillo-based rosarians, have grown Old Garden Roses since 1987. Along the way, through trial and error and with the help of others, they've learned a lot about what works (and what does not work) in our mild climate. 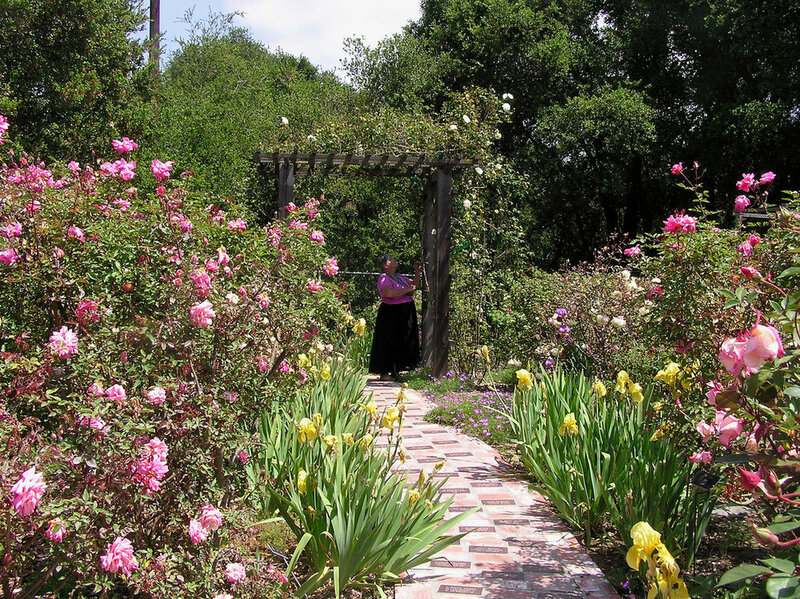 Jeri designed the Stagecoach Inn Museum's Heritage Rose Garden, and they helped to plant the garden in 1994. Jeri and Clay will discuss, demonstrate, and help to prune this lovely mature garden. Jeri and Clay are respectively the National Convener and the Membership Chairman of the national Heritage Roses Group. Bring your gloves and pruning tools. Open to the public. No charge. This community beautification project is sponsored by the City of Thousand Oaks Community Enhancement Grant Program. We are excited that Rita is gracing us with one of her well-researched programs again. LOCATION CHANGE: We will meet in Anderson Hall at the museum! The group will continue to meet on the third Thursday morning of each month. Be sure to put these dates on your calendar, as we’re working on filling them with speakers and other antiques and collectibles activities. Let Penny or Roz know of any program speakers you would especially like to see in 2019. Remember: RSVP and find those old pens and pencils! Penny, pen1@verizon.netor home 805-495-3297, cell 805-444-3160. Roz, rozgold@yahoo.com or home 818-889-6904, cell: 818-667-3899. Lindalisa, lindalisasemail@yahoo.com or 818-414-8046. Brenda Harvie and Penny Strowger will present collectibles from travel in Asia and the Pacific. The word of emphasis is “few”, so bring some of your own collectibles, preferably from Asia or countries on the Pacific Rim, for show and tell. Keep in mind that this is an Antiques and Collectibles STUDY Group and do some research on your items in order to present them at the meeting. If possible let Penny know what you’re bringing so she can plan a logical flow of topics. Of course, refreshments will be served. Your contributions to the goodies table are always welcome. Penny, pen1@verizon.net or home 805-495-3297 (cell for texts: 805-444-3160) or Roz, rozgold@yahoo.com or home 818-889-6904 (cell: 818-667-3899). Be ready to share stories about how to enhance the tour experience for museum guests. Although we normally meet on the third Thursday morning of each month, in December the date will be Thursday, December 13. We’ll enjoy a delicious lunch at Marcello’s, an Italian restaurant in Thousand Oaks. Cost is $15; $20 for non-member guests; all payable in advance. Please RSVP by December 3rd to Lindalisa Louis at (818) 814-8046. Also bring to the party a wrapped gift, a new or gently used item with a maximum value of $15, for our gift exchange game. Holiday Open House "A Child's Dream of the Holidays"
Kids of all ages are invited to celebrate the holiday spirit at our Annual Holiday Open House. 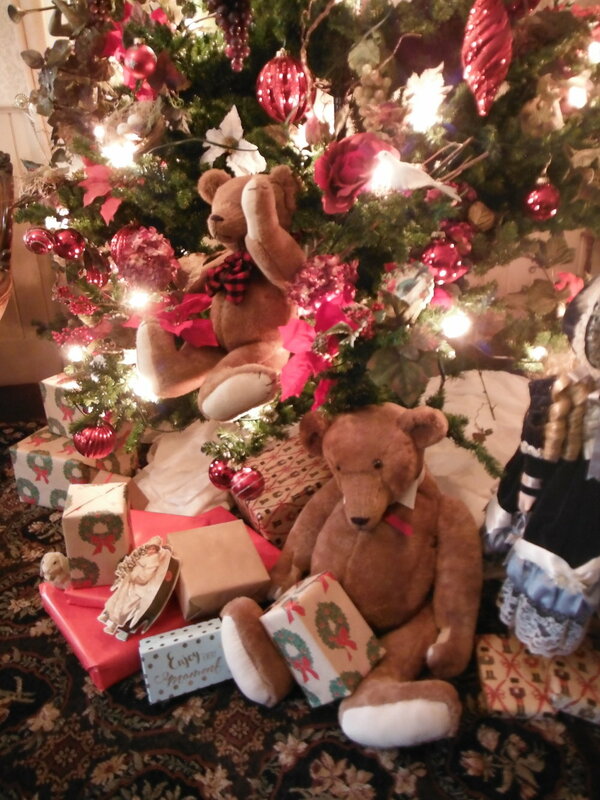 An afternoon of wonder full activities include storytelling with Mrs. Claus, holiday card making and tree decorating. Music on the porch provided by the Newbury Park High School String Quartet, and refreshments will be downstairs in Anderson Hall. The Stagecoach Inn will be decorated to the nines, so stop by for a walk through. Story telling at the Pioneer House at 1:30, 2:30, and 3:30. Help us decorate the Holiday Tree in Timber School. All CVHS staff and volunteers are invited to the 2018 Annual Docent Installation Luncheon, to be held at the CRPD Community Room, CRPD Headquarters, 401 Hillcrest, Thousand Oaks. Cost is $10.00/person. For reservations call Debra Payne at 805-501-2417 or Melanie Lindgren at 805-492-6745 by November 12, 2017. Richard Senate has decades of experience as a world-renowned paranormal investigator and ghost storyteller. Mr. Senate is also a historian and lecturer specializing in early California history, especially Ventura, Ojai, and Ventura County. Join us at the CVHS Annual Meeting for ghost stories in our own neighborhood. A short business meeting, including a vote for 2019 CVHS Officers and Trustees, will be followed by Mr. Senate’s talk, and refreshments. Free, but seating is limited. Reservations please at (805) 498-9441. 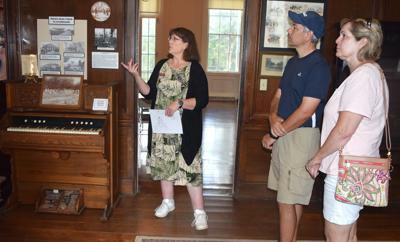 Museum tours will be held from 1:00 to 4:00 at the regular price. Antiques and Collectibles Study Group with Brenda Harvie. In the past these faux diamonds - made to imitate real and very expensive diamonds - have been known at strass or paste. Wealthy people copied their jewels as highway robbery was very common. After Daniel Swarovski’s electric cutting machine allowed mass production, rhinestones were used on many items: costume jewelry, clothing, purses, perfume atomizers, etc. Brenda will also talk briefly about a few of the over 900 costume jewelry manufacturers in the U.S. in the mid-century period and display a few of the rhinestone-studded items. Please bring some of your own rhinestone things for show and tell. No charge; public welcome; refreshments will be served. Meet at the museum downstairs in Anderson Hall. Call Penny at (805) 495-3297; pen1@verizon.net; for more information. Ostensibly the story of a pioneer woman and her six daughters, QUILTERS blends a series of interrelated scenes into a rich mosaic which captures the sweep and beauty, the terror and joy, the harsh challenge and abiding rewards of frontier life. 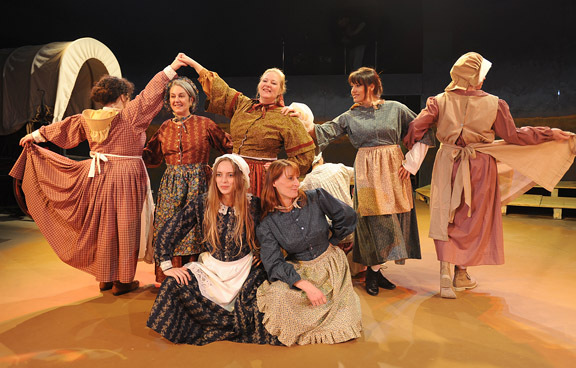 Illuminating stories contained in various patches or "blocks" with music, dance and drama, the action depicts the lot of women on the frontier: girlhood, marriage, childbirth, spinsterhood, twisters, fire, illness and death. Have you always longed to dress up in Victorian costumes, put on your cowboy gear in the morning, or play the part of a pioneer in the Old West? If the answer is yes, then you're the man or women we've been looking for. Our docents interpret Conejo Valley history in costume, sharing their love of history with museum visitors: young, old, and in-between. Sign up to be a volunteer docent and join our next 2-day training session at the museum. Leave a message for Nellie Cusworth at 805 497 1930 or nelliekerrcusworth@gmail.com. It's fall of 1876 on "El Rancho Conejo" (later known as the Conejo Valley), and the Grand Union Hotel is open for business! Newbury Park has it's own post office and Timberville will soon be a hamlet surrounding the hotel. It's the year of Custer's Last Stand, the last year of President Ulysses S. Grant's term of office, and the nation's Centennial Celebration. Catch a stage to the Stagecoach Inn Museum for an Old West theater experience. Watch historical vignettes at several locations around the museum grounds, and meet some of the local pioneers. There are two routes through the performances, for different walking abilities. Reservations are required. Purchase them here. Performances at 6:00, 6:30, 7:00, 7:30, 8:00 on September 22, 23, 29, and 30. $20 per ticket, CVHS members $15 w/discount code. Please arrive 10 minutes before your performance time. Park in the Susan Drive parking lot or the park grounds, which are accessed from Lynn Road. Wear comfortable shoes. Guests must be at least 8 years old. Rock for a Cause - Karaoke Challenge! Support the Stagecoach Inn Museum and SIM's own chanteuse, Melanie Lindgren, as she sings Patsy Cline's "Crazy" (best song ever!). It's a Charity Karaoke, with live band Microphone Heroes, benefiting 20 Conejo Valley nonprofits, each featuring their own karaoke singer. The Sept. 21 performance will start at 6 p.m. and will be emceed by Patrick Cassidy, an actor known for his roles in musical theater and television. Donate here to support Melanie's performance (it all goes to fund the Museum and our programs); any amount is gratefully accepted! To join in the fun at Borderline Bar and Grill, purchase tickets to attend the event at charitykaraoke.org. On the night of the event, audience members - in person and those watching via live streaming - vote for “Best Performance” and “Most Money Raised.” A $1,000 prize will be awarded for each category and will go directly to the singer’s nonprofit. Borderline Bar and Grill, 99 Rollling Oaks Drive, Thousand Oaks. Doors open at 5:00; show starts at 6:00. Food and drinks available for purchase. Event will be streamed live on Facebook. Enjoy this historic home and its legacies. It's a cultural landmark significant to many areas of California history: the rancho period, oral history, and Spanish Rancho architecture. The Reyes Adobe’s hearth draws people from the many different cultures that have influenced this scenic and strategically located property along the state’s famous El Camino Real. Through restoration and research efforts, the City of Agoura Hills has created an interpretive center and museum for visitors to hear their stories for years to come. Fun, fun, fun at a country fair fundraiser! Wear your straw hat and best suspenders and enjoy a parade, game booths, a hat decorating contest, a cake walk, snow cones and popcorn....that's just for starters! Then get ready for a gourmet dinner, dancing, live music, and silent and live auctions. Proceeds from this event, our annual fundraiser, support CVHS' educational programming for children and adults. Don and Dona Triunfo Awards will be presented to two members of the community, honoring them for their service to the Conejo Valley. Purchase Options Described. AVAILABLE NOW! 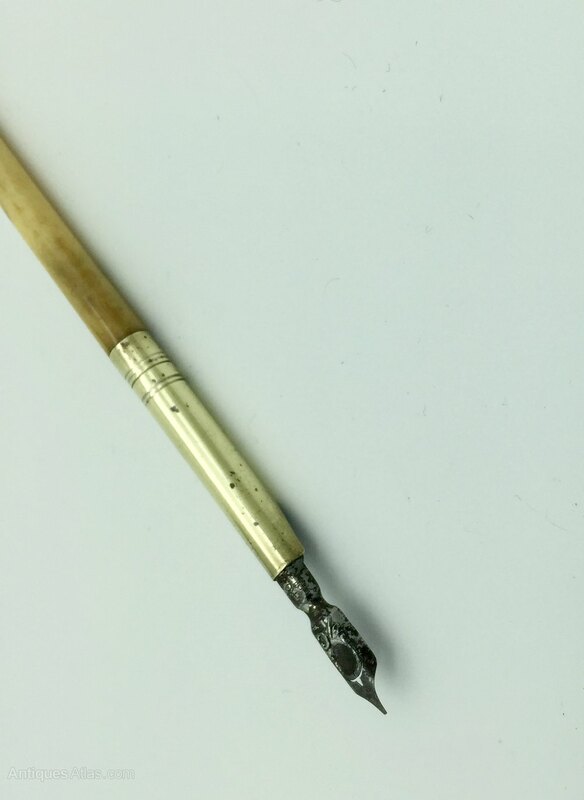 Come watch the artists at work! Stop by to see the artist's at work! Step back in time at Heritage Square in Los Angeles. Heritage Square is a living history museum that explores the settlement and development of Southern California from the Civil War to the early 20th Century, offering visitors a look into the everyday lives of Southern Californians at the close of the 19th Century. Let the fireworks begin! Well, actually, let the ice cream sundaes begin. Join us for a 4th of July celebration, with complimentary ice cream, music, and singalongs. The Stagecoach Inn Museum will be celebrating not only the birthday of our nation, but its own birthday as well. Tradition has it the the original Inn opened on July 4th, 1876. The City of Thousand Oaks presents An Evening of Americana Music on Friday, June 22nd, part of the Pop Up Art and Music Festival Series that runs three weekends in June 2018. The Stagecoach Inn Museum grounds open at 6pm, performances start at 7pm for this FREE concert! The evening is a B.Y.O.C. (Bring Your Own Chair) event. Performing will be The Honeysuckle Possums, and all woman string band, playing old-timey mountain music, originals, & bluegrass. Soaring three part harmonies are their specialty, with a driving stand up bass, and an Appalachian Flatfoot dancer. These gals have foot-stomping, down home, back porch style and their intention is to create and share joy wherever they go! Also performing will be John Zipperer and The Current Band who bring a unique and refreshing blend of rock, folk, country and blues. Fans remark over and over about the joy when the band hits the stage and describe the music as “dynamic” and “original,” characterizing the shows as having smiles, laughs, foot-stomping and handclapping. Pack up the family and join us for this fun outdoor concert! For more information please contact art@toaks.org or call 805-449-2766. We'll carpool from the museum on a field trip to Antiques Adventures, an antique mall in Ventura, and eat lunch out after our visit. Antique Adventures is a unique shopping experience. They offer a wide range of antiques and one-of-a-kind items, as well as personally crafted items and both rustic and modern furniture. Shopping here is a journey through history or a walk down memory lane. Antique Adventures is owned and operated by Chuck Ackerman, a California native, whose ancestors immigrated from Holland in 1662. Our annual Volunteer Recognition Luncheon will be held at Jackie Pizitz' house. Docents will be honored for their hard work and years of service. Lunch is potluck, so we're guaranteed to have a selection of delicious dishes. Pioneer Jamboree- for the whole family! We have two parking locations- one next to the Museum on Ventu Park and one behind the Museum on Susan Drive. Don't forget to bring the whole family! Admission tickets for the June 9, 2018. Print receipt and bring it to the museum. Jane Robin will discuss her collection of green Jadeite and blue Delphite and her colorful glass knives. Jadeite and Delphite were manufactured by the Jeanette Glass Company between 1932 and 1936 in Jeanette, Pennsylvania. Jane will explain how to distinguish it from later versions (1950s), made by other companies, and from modern imitators. Glass knives were patented as early as 1920 and manufactured until about 1940. They were marketed as the perfect implement to cut fruits and cakes. Never mind that they chipped like crazy! For show and tell, be sure to bring any items that you have or can borrow in these categories. This will be held in Anderson Hall at the museum. Refreshments will be served. Malibu Creek State Park is over 8,000 acres of beautiful scenery with 15 miles of streamside trail through oak and sycamore woodlands and chaparral-covered slopes. There are dramatic, jagged peaks, stunning canyon vistas, oak woodlands, rolling hills of tallgrass, a large volcanic swimming hole. Little has changed since the Chumash settled here 5,000 to 10,000 years ago. We'll gather at Ladyface Ale Companie in Agoura Hills for lunch following the hike.